In 1958 the banknotes of the National Bank of Iraq were circulating in Iraq. This was despite the fact that the ‘Law of the Central Bank of Iraq No.72/1956’, creating the Central Bank of Iraq, was gazetted on 1 July 1956. This law effectively changed the powers and the name of Iraq’s central bank, from the ‘National Bank of Iraq’ to the ‘Central Bank of Iraq’. However, the events of 1958 were to see a monumental change in the rule and administration of Iraq that would lead to significant changes in the banknotes circulating in Iraq—changes that went beyond the title of the issuing authority. The first event of significance in 1958 was the founding of the Arab Federation between Iraq and Jordan, announced in Ammam on 14 February 1958. The Federation united the Hashemite Kingdom of Jordan, under the reign of King Hussein, with the Hashemite Kingdom of Iraq, under the rule of King Faisal II. Both kings traced their immediate families to King Hussein, the former king of the Hijaz. The Arab Federation had numerous aims, including the goals of establishing one parliament, one army, a common customs zone and single ministries of Defence, Justice and Foreign Affairs. They also planned to unify the currencies of Iraq and Jordan. King Faisal of Iraq was to be Head of State with King Hussein of Jordan being deputy Head of State; although each monarch would retain constitutional authority in their own kingdom. The formation of the Federation was a significant factor in galvanizing opposition to the monarchy amongst nationalist elements in Iraq and probably assisted in promoting action by elements opposed to the monarchy. In early July 1958 Iraq sent troops to Jordan as a display of force and a show of unity between the two states of the Federation. By this time the structure of a revolution was in place and, as troops passed through Baghdad on their way to Jordan, the revolutionaries took control of the capital in the early hours of 14 July 1958 under the direction of Brigadier Abdul Karim Kassem. King Faisal II, Crown Prince Abdul Ilah Hafidh and Nuri al-Said (Prime Minister of the Arab Federation and former Prime Minister of Iraq) were assassinated during the revolt. The overthrow of the monarchy and the introduction of a republican regime brought widespread changes to Iraq. Most of the changes wrought on Iraq are of peripheral interest to this study, but a change of currency was inevitable since all banknotes issued in Iraq carried a portrait of the monarch. The change did take place, but perhaps without the alacrity that might have been expected. The change in name from the ‘National Bank of Iraq’ to the ‘Central Bank of Iraq’ had occurred on 1 July 1956 during the period of the monarchy, but the first notes of the Central Bank were not issued until some months after the monarchy had been overthrown in 1958. The first banknotes issued by the Central Bank of Iraq constituted the eighth series of banknotes issued in Iraq and the notes of this series were released into circulation on 5 February 1959 (although the date of 2 February has also been reported ). The notes of the eighth series had been ordered some months prior to the revolution that toppled the monarchy. It is not known why there was a delay in introducing these notes. It seems reasonable to expect that notes prepared for the new issuing authority might have been introduced at the earliest opportunity, but there may have been sufficient notes in circulation or there may have been administrative machinations that delayed their introduction. Illustration on back – Date palms. Illustration on back – The ruins of the Great Mosque and the Malwiyah Minaret at Samarra. Although the first two notes issued under this release maintained the portrait of King Faisal II that was used on the previous issue, subsequent notes carried the portrait of a more mature King. The principal change to the notes of the second installment of the eighth issue is that they carry the later portrait. All other design features, including the watermark, remain constant with the design introduced for the first two notes issued by the Central Bank. The notes continue to carry the signature of the assassinated Crown Prince, Abdul Ilah Hafidh. Illustration on back – A statue of King Faisal I mounted on his steed. Illustration on back – Hammurabi receiving the code of laws from Shamash the Sun God, who was also the God of Justice. Illustration on back – A winged Assyrian bull and an Assyrian priest. Nota Bene: SCWPM No. 47, the ½ Dinar with the final portrait of Faisal II, was never issued, although it is believed to exist as a specimen note. The ‘Immortal’ revolution of 14 July 1958 saw the overthrow of the monarchy and the creation of the Republic of Iraq. On 8 August 1958, less than a month after the revolution, the Arab News Agency reported that the Iraqi Government was minting a new currency that would gradually replace the money in circulation. The report was a little premature in recording official activity, as the law authorizing the introduction of the new ‘Republican’ currency was not promulgated until six months later. Indeed, not only did the notes issued by the National Bank continue to circulate but, as discussed above, the first notes issued by the Central Bank, with the portrait of the deposed king, were introduced in February 1959, some seven months after the revolution. Undoubtedly the leaders of the revolution would have been keen to introduce a new design for their notes, but the actual introduction of new designs took some time. The notes of the first republican issue carried the same backs as the notes of the previous issue, with one notable exception, and the fronts of the notes are very similar. The principal change in design on the front of the notes is the use of the Emblem of the Republic of Iraq in place of the portrait of King Faisal II. The text on the notes is also modified, with the phrase referring to Law No. 42 of 1947 being removed. The quarter-dinar note also has the border that had originally surrounded King Faisal removed, although the borders remain unchanged for the other denominations. • underneath the text for the denomination, in the centre of the notes, is the Arabic text: ‘Currency Note Issued Under the Law’. The watermark on the notes of the quarter-, half- and one-dinar notes is of the Emblem of Republican Iraq, while on the 5- and 10-dinar notes it is the ‘symbol of the immortal Revolution’ (see description and comment below). The back of each note carried designs similar to the notes previously issued by the National and Central Banks, with the text continuing to be in English. The exception was the 1-dinar note, where the previously used equestrian statue of King Faisal I was replaced with the Lyre of Ur. The peculiar wording of Article 4 of Ordinance 459, which authorized the introduction of these notes, states: ‘The notes provided for in this Ordinance shall begin to be used on any date preceding 14th July 1959’. The Ordinance was signed on 4 July 1959 and it is understood that the notes were issued from 8 July 1959 (see above). Illustration on back – The ruins of the Great Mosque and the Malwiyah Minaret of Samarra. Illustration on back – The Lyre of Ur in the centre, while to the lower left and right are depictions of the statue of the Lion of Babylon. The watermarks on the notes in this series are peculiar in that two different emblems are used. On the three lower-denomination notes the Emblem of the Republic is used, whilst on the two higher denominations the ‘symbol of the immortal Revolution created by Law No. 101 of 1959’ is used. As the Emblem of the Republic is also used as the principal design feature on the front of the notes, it is easy to see its form, but finding a reproduction of the ‘symbol of the immortal revolution’ is a little more difficult. The following descriptions are taken from official notices in the Iraq Weekly Gazette (printed in English). The eight-pointed, or ‘octagonal’, star officially denoted ‘the Arabic star which is used in Arabic architecture’ and identified Iraq as part of the Arab Nation. The red colour of the star denoted the Iraqi Revolution of 14 July. The Arabic sword and the Kurdish dagger were symbols chosen to unite the two peoples who inhabited Iraq. The ‘golden spike’ is in fact an ear of wheat and represented agriculture and life, while the black wheel with projections is evidently a cog, as it represents industry. The letter ‘J’ in the centre of the triangle is the first letter for the Arabic word for ‘army’, which is ‘Jaysh’. The Arabic word for ‘the People’ is ‘al-sha’ab’ and the word is written in a decorative form that constitutes most of the design. It is a common Arabic device to take a word and create a design or pattern from the word, as has been done in this case. The first notes issued by the Iraqi Republic remained in circulation until 1968, when they were replaced by the second issue. During the period that they circulated there were just a couple of subtle changes made to the notes. The notes of the initial issue, signed by Nadhim al-Zahawi, carried no security thread. However, all subsequent emissions of these notes—which carried the signatures of Abdul Latif al-Shawaf, Saleh Kubba and Khayer al-Din Haseeb—included a security thread which ran through the notes to the right of centre. The second subtle change occurs only in the 1-dinar note. 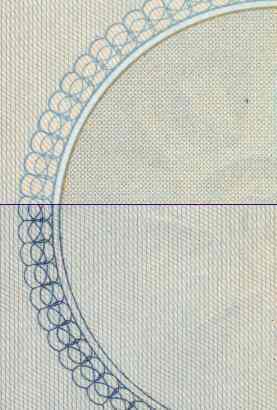 When this note was first issued (with the signature of Nadhim al-Zahawi), the border patterns encompassing the watermark and the ‘Emblem of the Iraq Republic’ were light blue and the vertical blue lines that covered the rest of the note, as an under-print, were excluded from the border pattern and from the circle containing the watermark. In fact, the pattern in the area over the watermark was constructed using small noughts and crosses. 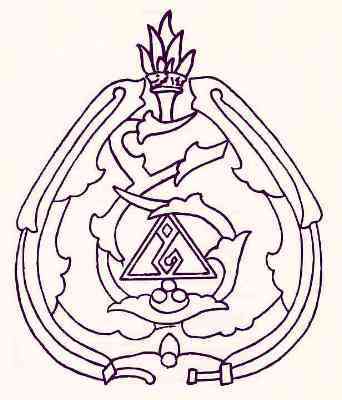 (This colouring and representation of the pattern replicated the design that was on the earlier issues of the Central Bank of Iraq and the National Bank of Iraq.) 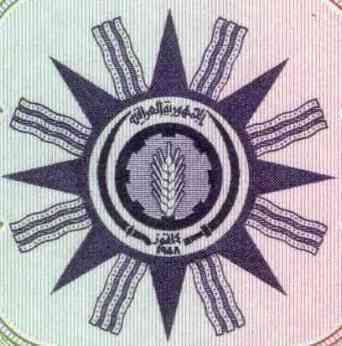 On subsequent issues, the pattern encircling the watermark and the ‘Emblem of the Iraq Republic’ were consistent with the under-print on the rest of the note, where dark blue lines define the border and the vertical blue lines can be seen within the pattern of the border and within the circle containing the watermark. Students of Iraqi notes tend to break Iraqi banknotes into various groups. Typically a major break is made between the issues under the monarchy and those under the republic, or between the issues of the National Bank and those of the Central Bank. As it transpires, all issues of the Central Bank occurred after the ‘Immortal’ revolution and therefore there is no temporal separation between these groups, although it is difficult to comprehend that the first banknotes issued by the republican regime consisted of notes bearing the portrait of the assassinated king. However, while the first notes issued under the republican regime carried the portrait of the king, it is those that carry the Emblem of the Iraqi Republic that are usually regarded as the ‘first’ republican issue. A reasonably simple series, the ‘first’ republican issue contains one of the prettiest notes ever to be issued—the green quarter-dinar note. It is less cluttered than other notes in this issue and the clear, crisp lines of the green intaglio print are set off beautifully by a multicoloured under-print. For this note alone, the series is worth collecting. Layth Al Muderis and Haider Al Saffar have assisted with aspects of this study and their input has been very welcome. Central Bank of Iraq Laws, Regulations & Ordinances Baghdad, 1965. Government of Iraq Iraq Weekly Gazette, pages 900-903 ‘1153 – Law No.57 of 1959 of The Emblem of the Iraq Republic’, Baghdad, 1959. Government of Iraq Iraq Weekly Gazette, pages 1028-1031 ‘2108 – Law No. (101) of 1959 For The Innovation of the Symbol of the Revolution of 14 July 1958 (The Eternal Iraqi Revolution)’, Baghdad, 1959.